The consultation closes on July 30. Trade union members have called for Ripon’s leisure centre crèche to have a wider community use, following the launch of a consultation that has cast doubt over the facility’s future. Harrogate Borough Council has raised concerns about the crèche’s viability, highlighting their latest figures that only four people attend each session on average, with annual running costs of £20,000. 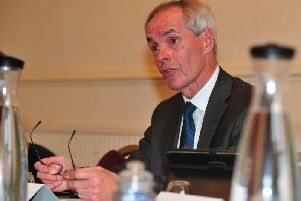 David Houlgate, Unison’s local government branch secretary for Harrogate, said: “We understand that the council is under tight financial restraint and cannot sustain £20,000 annual losses on running the crèche, but we and those staff under threat of possible redundancy, believe that with a different model of delivery and modest marketing and promotion, there is an opportunity to generate income for the council. “Staff feel that access to the crèche should not be limited to those using the site, as is currently the case, but be extended to the wider Ripon area, extending the catchment area significantly and enabling parents and grandparents to leave children in a safe, caring, enjoyable environment whilst exploring and shopping in the city. "It is also our belief that there will be increased opportunities once the swimming and leisure centre facilities are brought together on one site. "We believe that once the new pool is built, footfall at the combined facility will increase significantly, especially in relation to family use and with it a demand for a crèche. It would seem odd that what is going to be the district's biggest leisure facility may not have any childcare provision in the future."